The characters appear in surprising incarnations: a bag lady named Myrtle appears to be a conflation of Merlin and the Lady of the Lake (she lives by a canal.) Mordec is Arthur's domineering older brother, rather than his incestuously conceived son. Art seems to owe much to T.H. White's version of the boy-king as a decent, slightly fumbling idealist ("I don't get it" is one of his repeated lines.) He was sung sympathetically by Canadian lyric tenor Pascal Charbonneau. Lance, appropriately enough in my mind, is a somewhat preppy youth with a motorcycle (Le Chevalier de la Harley? ), and also a tenor. Without a libretto or score, it was sometimes difficult to keep track of the various members of the "knight crew" and their musical/textual characterizations, but the snippets on the website hint that such characterization was thought out, so my failure to pick up on it may be a result of less-than-ideal listening conditions. Still, it made for interesting listening, and was certainly rapturously received by its audience, whose hoots of acclamation were wild after each act. 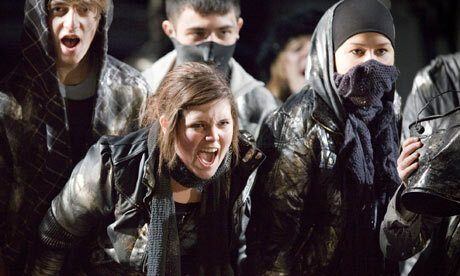 Opera against gang violence? All to the good.